There were a few different men in her mother’s life when Nicole Georges was growing up, but none of them was her father. As far as she knew, her father had died of colon cancer when she was two or three years old. But at a visit to a psychic on her twenty-third birthday, Georges is told that her father is still alive. Georges’ sister eventually confesses that the family has been lying to her all along, but the rest of the family closes ranks, and no one else will admit to knowing anything about her father. With her relationship with her mother already troubled by a turbulent past, and the fact the Georges is hiding her sexual orientation, Georges incongruously turns to conservative talk-show host Dr. Laura Schlessinger for advice about how to confront her mother. Georges must process hard truths, old lies and glaring inconsistencies in her life story in order to move forward. 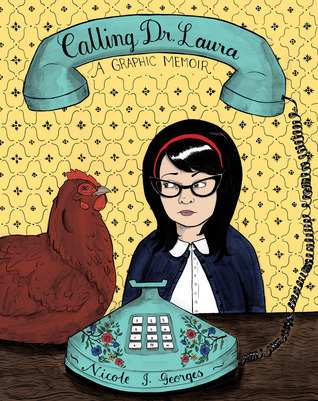 Calling Dr. Laura has an extremely personal, almost confessional feel. 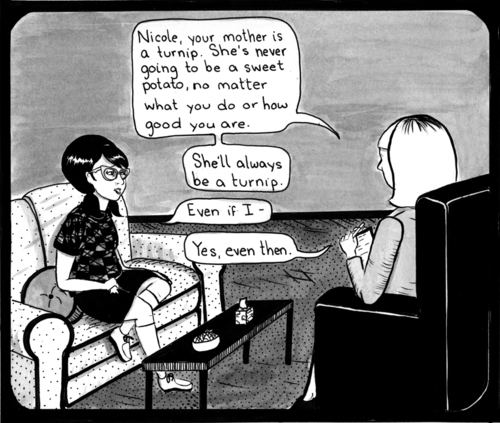 In many panels, Georges’ cartoon self speaks directly to the reader, creating a deep sense of intimacy (not to mention a deep desire to give Georges’ younger self better advice than what she is receiving on panel from various people, most especially Dr. Laura). With the exception of a few scene-setting panels, Georges focuses on depicting people, and her relatively simple drawings manage to convey incredible amounts of character through facial expressions and body language. The contrasting rounded cuteness and vulnerability in Georges’ portrayal of her childhood self underscores the impact her upbringing had on the period of her life chronicled in Calling Dr. Laura. Despite not focusing on the setting, Georges also does a great job of conveying what it is like to live in Portland and be part of its DIY art scene, which she isn’t above poking fun at. Searching for her father forces Georges to re-examine seemingly unrelated aspects of her life, particularly her relationship with her girlfriend, Radar. The above plot summary necessarily glosses over the significant chunks of time that pass between the various steps of her search, and she processes and comes to terms with each new situation. There are long gaps between visiting the psychic and talking to her sister, and between the call to Dr. Laura and the decision to seriously pursue efforts to locate her father. These gaps conveniently give Georges room to explore what kind of life and family she wants to create for herself. This is done in depth, whereas Georges’ peculiar attraction to advice columnists goes largely unexplored—I was dying to know why she chose Dr. Laura in particular, of all the people she might have called or written to. Thus a story that is ostensibly about the search for a father, is really about all sorts of family connections, both those you are born with, and those you make, and how you negotiate them. This is a funny and well-told story, and one that many people will find more accessible than Are You My Mother? or Fun Home, to which it is often compared. 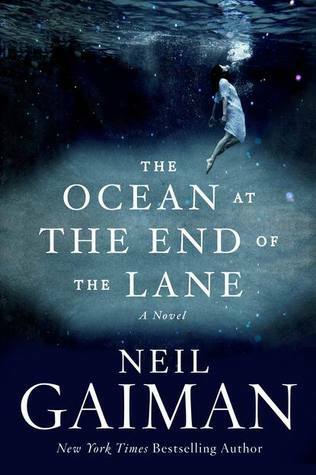 Want to win a signed copy of The Ocean at the End of the Lane by Neil Gaiman? Check out Required Reading’s First Birthday Giveaway. Thanks for reading! Required Reading First Birthday Giveaway!